2nd son of Sir Robert Rich, Bart. Lieutenant Colonel of the King’s Own 24 June 1744. Wounded at the Battle of Culloden, April 1746, and had right arm amputated. Colonel of the King’s Own 22 August 1749 to 12 May 1756. Was present at the Siege of Minorca. Major General 1758. Lieutenant General 1760. Governor of Londonderry. Succeeded to title 1768 and left the service owing to a dispute with the Government. Died 1785. 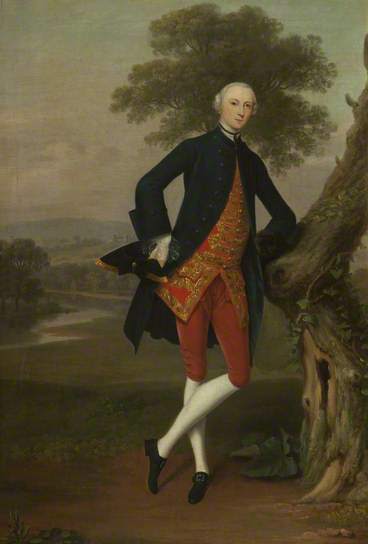 Colonel Sir Robert Rich (1714-1785), around 1756. Oil painting by Arthur Devis, 1712-1787. Lieutenant Colonel Robert Rich commanded the Regiment at the Battle of Culloden, in the absence of Colonel Barrell. The Regiment suffered very heavy casualties. Sir Robert lost his left hand - notice the empty fur-lined sleeve - and his right arm was almost severed above the elbow. He commissioned the successful Preston artist Arthur Devis to paint his portrait. After Rich’s death in 1785 the painting was left to Mr Duncan, the Regimental chaplain who had saved his life. The painting was later returned to the Rich family. The picture has an elaborate 18th century frame decorated with war trophies. KO 0566/01 Gift of Lady Rich.